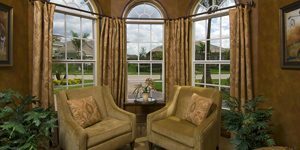 Turn to Majors Home Improvement for durable, energy efficient windows that are built to stand the test of time at homes in Pensacola, Florida, and nearby areas. We are a local, family-owned home remodeling company that installs replacement windows that provide exceptional energy efficiency and durability. We hold an A+ rating with the Better Business Bureau and a five-star rating with GuildQuality, accolades that we’ve earned due to our commitment to providing total customer satisfaction. We install Majors Select™ Vinyl Windows that come in all of the most popular styles, including single hung, picture, storm, bay, casement, double hung, and more. They are made to operate effortlessly in all weather conditions and their solid vinyl construction means they are low maintenance and will never rot, rust, crack, warp, or otherwise deteriorate. What’s more, these windows are incredibly energy efficient and feature multiple chambers and insulated glass to keep the cold air out in the winter and the warm air out in the summer. In turn, you won’t have to run your HVAC system as hard to maintain a comfortable indoor temperature, potentially leading to savings on your energy bills down the road. If you’d like to discuss having energy efficient windows installed at your home in the Pensacola, FL, area, then contact Majors Home Improvement today. We’ll be pleased to schedule a consultation.